"Our work is just beginning." Halcyon 6: Starbase Commander is, and I quote, a "retro space strategy RPG with base building, deep tactical combat, crew management and emergent storytelling". It doesn't look particularly retro to me, but developer Massive Damage cites classic oldies including Master of Orion, Star Control, X-COM (note the hyphen!) and Civilization as inspirations, while doffing its corked developer hat to modern space roguelike FTL. Those are some weighty influences to just drop in the Steam description box, so let's look at the launch trailer to see what it's doing with 'em. Huh, would you look at that. One influence they appear to have missed is "JRPGs", as when fights do occur, they take the form of side-on rumbles in the manner of the early Final Fantasy games. 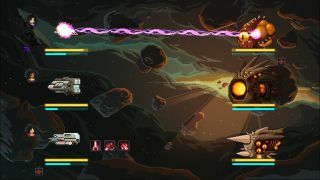 Halcyon 6 promises base-building, exploration, crew management, tactical combat and story events, with a big dose of random generation to ensure that replays aren't too repetitive. It's been in Steam Early Access for a few months now, but the game released for real a couple of days ago, with a 15% launch discount that expires in a few days' time. You can find it on Steam here.